I’m always interested in a good thriller and, knowing little about the history of the Soviet Union, I thought that The Secret Speech by Tom Rob Smith would be an interesting book to read. 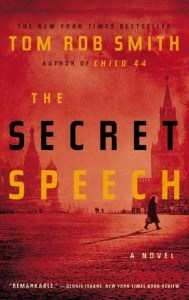 The Secret Speech is the sequel to Child 44, Smith’s debut novel which was highly acclaimed. Due to the historical elements of the novel, I thought it would be easy to read the second book in the series on its own and interested to see if that would be the case. The focus of the novel lies in the character of Leo Demidov, a member of the Secret Police who is now running a homicide department in the Soviet Union. In the past, Demidov has worked for Stalin and has engaged in fear and brutality that were common under Stalin’s regime. In The Secret Speech Stalin has died and Khrushchev is now the man in power. Khrushchev is leading the Soviet Union and he makes the secret speech alluded to in the book’s title. In this speech he talks about the desire to move the country into a new era that would minimize the violence of his predecessor. This speech results in a huge fallout (as it quickly stops being a secret) that causes many who previously engaged in this sanctioned violence to fear the repercussions or face their own decisions under the previous regime. Demidov, in the midst of this turmoil, has to face the things he has done in the past and decide how he will choose to carry on. The politics, murder and mayhem continue to raise their ugly head throughout the course of the novel. This novel is interesting because it uses historical facts to provide a framework for the plot. I think I would have enjoyed it more if I had read Child 44 first because I think it would have helped me to better understand Demidov and the events that have taken place. I found it difficult to make a connection with Demidov in this novel and, as such, it lost some interest for me. That being said, readers who enjoy historical fiction or the history of the Soviet Union may really enjoy this novel. I would suggest, however, that you read the first book before taking on The Secret Speech as I wish I had done. Thanks for this review. The Secret Speech is one that I’m considering putting on my wishlist, but, like you, I’m always interested in whether or not a book stands on it’s own when it’s a continuation of a series. Thanks for the advice about reading the first one, then this one! P.S. You’re in the lead for Who’s Who right now! I’ll keep voting every day! Good luck!